I did a series review of the first three books in this space opera last summer and, having finished the books at last, realized it was only fitting to review the last three novels as well. I couldn't find much to say about the fourth novel, Killbox--which was excellent with the exception of rather unnecessary relationship drama--but here are my thoughts on the conclusion to this series. 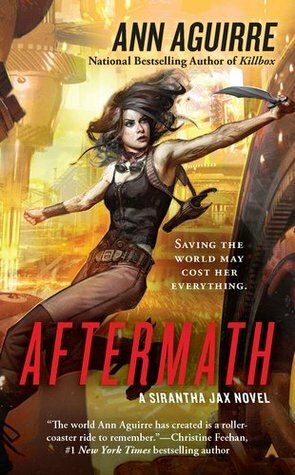 Aftermath got off to a promising start, what with Jax on trial against the Conglomerate, but it quickly became apparent that Book 5 of the Sirantha Jax Series was very much a--and I hate to use this word--filler novel. Essentially, nothing much happens. Jax isn't acting as a diplomat to a foreign planet, she isn't off fighting a war, and nor is she doing much jumping. Aftermath fills in the gaps that we've forgotten about since Doublebind burst onto the page and, as such, it isn't a favorite of mine. Yet, by no means is it forgettable. If anything, the emotional growth Jax undergoes throughout this novel--not to mention the palpable strength of her bond with both Vel and March--push this story onward. It's the most introspective novel of the series, oddly enough, and though there is plenty of action, it isn't the most memorable aspect of this tale. Instead, combing through Vel's past, facing the harsh realities of March and Jax's relationship, and labeling the differences between the bonds Vel and March share with Sirantha cause Aftermath to stand out. It's an emotional journey, from beginning to end, and though it falters in part plot-wise, it's still a valuable addition to the series. Aftermath may have lacked much of a climax, what with every issue Jax tackling resolving itself far too easily, but I'm still on board with this crew. With Endgame up next, I should be feeling nostalgic but I think I'm ready to see Jax off, once and for all. I just hope it's as explosive of a conclusion as I'm gearing up for. I thought I was ready to say goodbye to Sirantha Jax after Aftermath, but Endgame is such a brilliantly plotted novel that I feel nostalgic, bittersweet, and ever-so-upset after all. Aguirre's Endgame weaves together everything I've loved about this series since Grimspace: excellent world-building, blooming character growth, and complex relationships. Once again, Sirantha Jax is a solider, a fighter, a warrior. On La'heng now, she is determined to free an enslaved race of people--despite knowing the mission will keep her on ground for years to come. Endgame has no shortage of well-written battle scenes, devious schemes, and military plans ensuring its plot is set at a break-neck pace. Nevertheless, the strength of this novel stems from Sirantha herself; from the bond of friendship she sustains with Vel and the lengths she will go to aid him, from the relationship she shares with March and the difficulties they endure, from the new characters she meets and the sacrifices she makes even for them. Endgame doesn't allow Sirantha to take the "easy" way out, charging in guns blazing and somehow saving the day. Instead, it pushes her to her limits testing her patience, her unselfish desires, and her loyalty to those around her. It compels her to both stay and to fight, though not always in combat. Where this novel suffers, in my eyes, is in the odd jumps of time. The war on La'heng takes years and for Sirantha to oddly mention that a year or six months have passed from the turn of a page is jarring, to say the least. Yet, despite it all, I love her and her romance with March undergoes necessary strife in this novel. 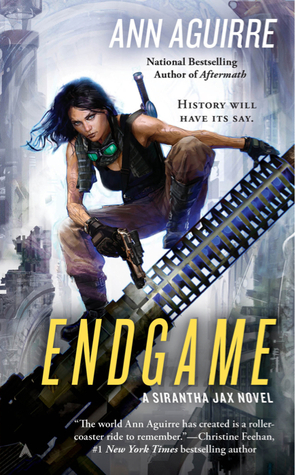 Unlike past novels where Sirantha and March have been thrown into dramatic situations, likely to prolong the story, in Endgame these two finally embrace the honesty of their relationship and unearth their hidden insecurities. It isn't always easy, between these two, but it's always strong and sure. Sirantha's relationship with Vel is of a different--and frankly easier--nature, but that in no way diminishes its strength. For me, this series is defined by the two men in Sirantha's life; both their respect for her and her respect for them. Aguirre never fails to create fascinating, equal-footed relationships and that isn't different even with this volume. Endgame is, well and truly, the end. Aguirre has not left this world, thankfully, though Sirantha and her journeys are behind us now. Will I miss her? Yes, undoubtedly. Somewhere between all the psychological probing of Sirantha's mind, I fell in love with her, flaws and all. Nevertheless, all good things must come to an end and, as always, Sirantha goes out with a memorable bang, never a whimper. In case you missed my reviews of the first three novels in this series last summer or just want a refresher, you can read them HERE. I haven't read anything by Ann Aguirre, except for ENCLAVE. This sounds pretty good, though, because I'm a huge fan of science-fiction romance and space operas! Great reviews, Keertana. Filler novels can be so hard. I am glad book six was way better for you. That's something I love about Aguirre -- she doesn't let her characters off easy, not even when the end is in sight. I'm really enjoying the new series in this world! Very dark and gritty and intense. Fab reviews, doll! I'm so glad this series ended with a bang for you Keertana! I love when a later book in a series reminds me of everything I love about the series as a whole, and it sounds like Endgame did that for you perfectly. I read the first book in this series and really enjoyed it, so I look forward to getting caught up!!! It's nice that the next book in the series rekindled your love. Sometimes longer series start to be hit or miss- at least it seems that way from various reviews. I don't read a lot of series these days...let alone really long ones! I have book 1 and 6 but I haven't tried thel yet, I really should! I have book one in my tbr and I need to get to it. Even though #5 was a 3, #6 ended strong. I do enjoy her worldbuilding much more than her characters. Glad there is so much of it especially in the last book! So happy it ends with a bang! It's amazing to see a series that improves upon a former rating, and I love that this one does so. I think that the concept of this novel is gold, and clearly I need to pick it up stat. Lovely reviews! For me, Killbox was the least favorite of the six. I loved Aftermath precisely because it was so introspective and because of how Sirantha and Vel's relationship developed. The ending just about broke my heart. I remember hiding from my kid in the bathroom to to cry. And Endgame, ohh, my God. I loved that the thing on La'heng took years to resolve. I loved that the war was done so realistically. I mean, wars are long, and dirty and exhausting, and there simply are no winners. Honestly, I thought it was brilliant. I hope you'll read the spin-off next. We're already two books in. Favorite Books of 2014 (So Far)!